I’ve been finding some old, never-published posts in the archives. I still think they have some value, even if the content is a bit dated. I will publish them from time to time, but will let you know that it’s older. This particular post is about a classic restaurant in Vancouver that I visited twice: once right after college, and once in 2012. This is the second post in the Summer in the Pacific Northwest Series, which is sort of being run concurrently with the Oh Canada Series (partly due to some overlap). Other posts in this series include Din Tai Fung, Bellevue. Other posts about Canada can be found here. 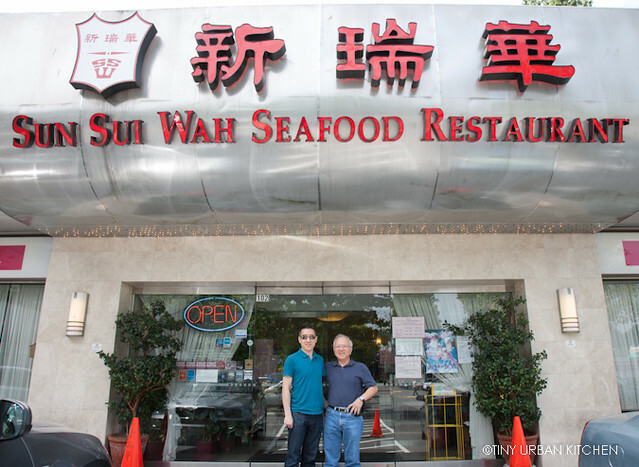 I first visited Sun Sui Wah right after I had graduated from college. I was visiting one of my best friends, whose family lives in Bellingham, Washington, about an hour south of Vancouver. Her dad, the ever-gracious host, drove our entire family in his minivan up to Vancouver for a day. While there, he had to introduce us to Sun Sui Wah. Seriously? People will fly to Canada from Honk Kong for the food? Over a decade later, I came back to Vancouver with Bryan’s family. We knew Sun Sui Wah was one of the most famous places in the city, so we stopped by for a dim sum lunch (and the famous squab, of course). Dim sum classics were all over the menu, and they were very good. After all, Sun Sui Wah is also known for its dim sum. Pictured above, taro cakes and turnip cakes (yum!). We like to be healthy and balance our our dim sum with vegetables. Thankfully Sun Sui Wah has several options, including a simple steamed Chinese broccoli with oyster sauce (left) and pea tendrils with oyster mushrooms (right). From upper left corner, clockwise: steamed bamboo wrapped sticky rice dumplings, rolled flaky pastry, shrimp dumplings (har gao), and deep fried glutinous rice dumplings filled with meat. From upper left corner, clockwise: steamed beef tripe, spare ribs, chicken feet, and corn dumplings. We also ordered one crispy pan fried noodle dish with an assortment of goodies, like shrimp, scallops, Chinese roast pork, Chinese broccoli, and mushrooms. And then the famous squab. The skin was perfectly crispy on the outside, and yet the meat had a deep, rich flavor on the inside. It was very tasty. Yes, gamey, and not much fat. I enjoyed it, though I’m not sure if I would fly all the way here from Hong Kong. I think Hong Kong has plenty of good food that would keep me busy for quite some time. Epilogue: for dessert, we had simple deep fried sesame covered mochi balls filled with black sesame.